Linda LaRue Blog: The Late Summer Make Healthy A Lifestyle Is Here! The late summer Make Healthy a Lifestyle is here! For me, summers have always been about 3 things: swimming, grilling, and salads. That’s why I’ve decided in this issue to feature these 3 things I love most about summer. Second, grilling. Living in California for the past two decades has influenced all aspects of my life—especially food. I am crazy about Mexican food. My favorite dish is grilled Mahi Mahi fish tacos. For me summer’s are about having Mahi Mahi Taco Tuesday’s with loads of fresh pico de gallo made with fresh, farmer's market heirloom Brandywine tomatoes—YUM. 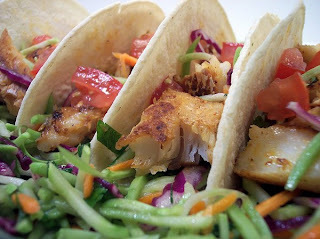 Try my fast food fav Mahi Mahi fish taco recipe. To join my FREE digital magazine, Make Healthy A Lifestyle, click here.